Glary Disk Cleaner is a free disk utility designed to help you keep your disk clean by deleting unnecessary files. Usually, these unnecessary or junk files appear as the results of program incomplete uninstallers, temporary Internet Files, etc. With its intuitive and easy to use interface, Glary Disk Cleaner helps you quickly wipe out all the junk files. 1. The Above Red Area: shows how much space of junk files found and allows you to rescan junk files, as well as cleanup all the unnecessary files. 2. Left-hand Side Button: allows you to select the needed tasks to scan junk files. 3. Right-hand Side box: displays the summary of junk files found with its path. For the one you do not want to clean, do not check it. Just choose the right one you need to wipe out, and click "Start Cleaning" in the upper box of the main window. Windows applications create several files on your hard drive for temporarily storing the data. These files are supposed to be removed when application terminates. Often, however, the temporary files are not removed because of a program error or careless architecture, because your system was reset or not shut down properly, or because another application has stopped responding or crashed. It is important to cleanup those files to keep your PC running fast and smooth. 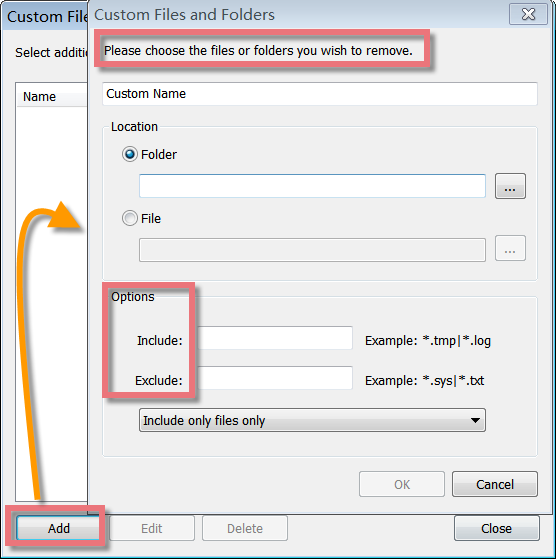 You can use "Custom Files and Folders" feature to cleanup the files and folders you want. You can find "Custom Files and Folders" feature from "Edit" menu at the top, or directly click "Custom Files and Folders" at the bottom of this page, a new window will pop up. On the pop-up window, click "add" button, you will get another window that allows you to choose the files, folders or enter the include content you wish to remove, and click "OK" button. Then you can "scan" the file or folders you just selected, and choose to "start cleaning" after checking the files from the report of total junk files. File Menu. At some point if you decide to stop the backup process, click on 'Cancel' button on the new pop-up window. 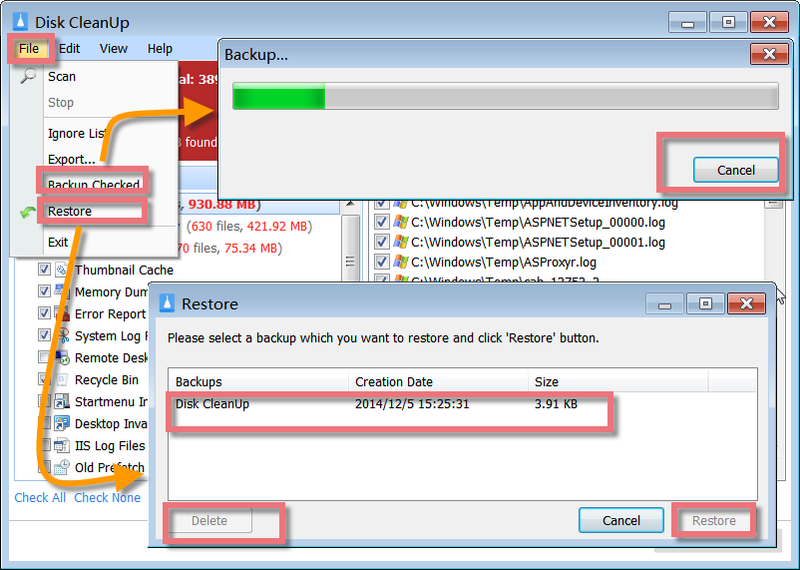 To restore a backup, you can click "Restore" from File menu, a box will show you these backups. According to the Creation Date, Size, you can choose the one you want to recover, then click "Restore" button. If you want to remove the backups, just choose the backup, click "Delete" button. Junk and obsolete files can accumulate to megabytes of wasted hard drive space, as well as turn into potential error-producing cross-linked drive references. Disk Cleaner targets these specific types of files which are missed by common disk utilities like Uninstaller, Defrag and Scandisk etc, ensuring that all junk files are removed from your system. 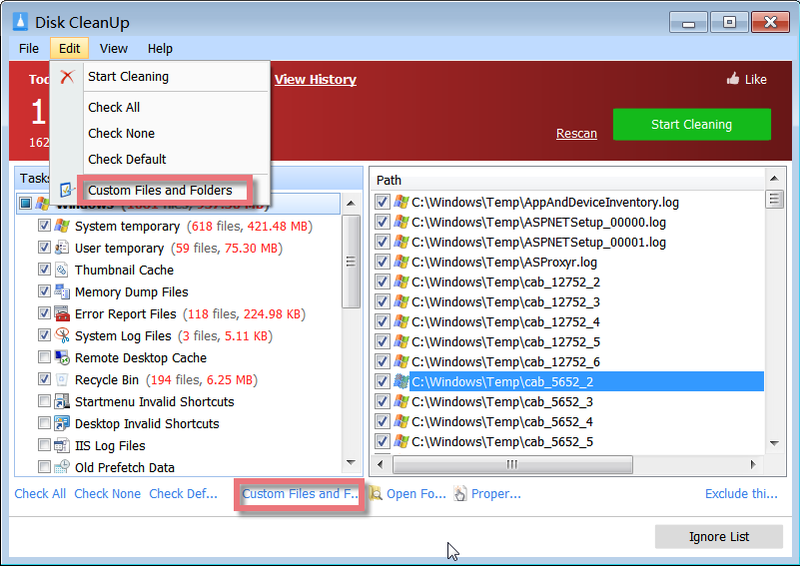 After scanning is completed, Disk Cleaner will display a summary report of total junk files found on your system. There are various options, and all of them self-explanatory. Click on the "Properties" at the below, you will see the detailed information about this file. Click on the "Open Folder" next to "Properties", you will find this file on its location. If you do not want to remove some files, you can add the files to ignore list. To exclude a file in search result, just mark the Check box in front of the file, and then click "Exclude this file" button, the file will be added to ignore list. If you want to remove the files from ignore list, you can click "Ignore List", a new window will pop up. Here you can view all the files that should never be considered as junk. Click "Add" button, you can exclude more files. To delete the files, just check up the box before the file, and then click "Remove" button, finally click "OK" button to close this window. Click "Cleanup" under Disk Space, Disk Cleaner will pop up. Find and click Disk CleanUp icon, Disk Cleaner will appear. Please note: if you want to add Disk Cleaner in the Dock bar, click in Dock bar, remove any icon by dragging it out of the Dock firstly, and then drag Disk Cleaner in.